The Interview: As Joseph Smith reported his visions and revelations designed to restore the New Testament church, another preacher living nearby sought the same goals, but through very different means. Despite the fact that both were Restorationists, each viewed the other as in error. 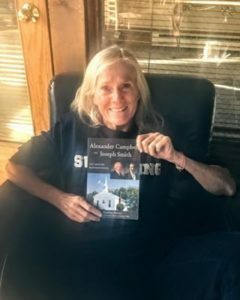 RoseAnn Benson, author of Alexander Campbell and Joseph Smith: 19th-Century Restorationists explains the similarities and contrasts between Joseph Smith and Alexander Campbell. Joseph reported an open heaven with divine communications and angelic visitations restoring knowledge and priesthood powers. Campbell claims the heavens were closed and only through a strict reading of the New Testament could Christ’s church be reestablished in the nineteenth-century. Shortly after the Book of Mormon was printed, critics raised their denunciations, but among them, it appears Alexander Campbell was the first to actually read the volume and write a book review, titling it “Delusions.” Calling Joseph Smith “as ignorant and impudent a knave as ever wrote a book,” Campbell claimed that “there never was a book more evidently written by one set of fingers, nor more certainly conceived in one cranium” than the Book of Mormon. Benson explains how Alexander Campbell’s influence on the earliest months after the church’s organization was greater than any other Christian religious leader, both for good and ill. Many early converts to Mormonism were proselyted from Campbell’s followers including a large number of leaders like Sidney Rigdon and Frederick G. Williams, who became counselors in the First Presidency. Enemies too came from the Campbellite persuasions, such as some who participated in the 1832 tarring and feathering of Joseph and Sidney. The two religious leaders never met, but their lives and pursuits intersected in multiple ways. RoseAnn Benson opens the door on this fascinating, if not short-lived competition. About Our Guest: RoseAnn Benson was an adjunct professor of ancient scripture and Church history and doctrine at Brigham Young University. She has served as the assistant coach for the BYU swim and dive team. RoseAnn Benson first started coaching at St. Petersburg Catholic High School in 1973. She has also coached at San Diego State University, James Madison University, Southern Illinois University, San Jose State University, and at West Florida Lightning Aquatics. RoseAnn Benson attended Brigham Young University where she earned a BA in physical education and minors in history and biology. Additionally, she obtained a K-12 teaching certificate. A few years later, RoseAnn Benson returned to BYU to receive a MS in exercise science with a minor in health science. Later, she went to Southern Illinois where she received a PhD in community and school health, emphasizing in nutrition. She also received an MA at BYU in ancient Near Eastern studies with an emphasis in religious education. VERY INTERESTING; I HAVE NOTICED A LOT OF SIMILARITIES IN THE TYPE OF CHRISTIANITY TAUGHT IN THE BOOK OF MORMON AND THE TEACHINGS OF ALEXANDER CAMPBELL IN HIS MAGAZINE, “THE CHRISTIAN BAPTIST” WHICH PRECEDED IT. AND AFTER MR. CAMPBELL READ THE BOOK OF MORMON HE SAID SARCHASTICLY, THE BOOK OF MORMON SOLVES ALL THE CONTROVERSIES THAT HAVE GONE ON BETWEEN CHRISTIAN DENOMINATIONS FOR CENTURIES. YES AND IT COMES DOWN ON THE SAME SIDE OF ISSUES AS MR. CAMPBELL DID. I THINK THEY ARE BOTH RIGHT.